There are Currently No Gepps Cross Apartments Available. Click Here to view a list of Gepps Cross Hotels Available. Breakfree Adelaide is located in the busy West End. This emerging arts district of Adelaide offers a colourful and unique array of theatres, restaurants and entertainment. With 142 studio and two bedroom apartments, the hotel offers a restaurant and bar and is only a short walk from the CBD, Convention Centre and Rundle Mall shopping. Enjoy the quiet location of these spacious and self catering two bedroom and three bedroom apartments and townhouses which are situated an easy stroll from the Adelaide city centre and parklands. Ideal for both short visits to Adelaide and longer term stays, the Carrington Gardens Apartments offer a relaxed and open environment, with a tennis court, spa and sauna at the property for guest use. The Oaks Embassy Apartments are ideally located on North Terrace, which is in the heart of the Adelaide city centre, directly opposite the Adelaide Convention Centre and close to many Adelaide restaurants, cultural sights, and fantastic Adelaide shopping precincts. Choose from a range of self contained one bedroom, two bedroom and three bedroom apartments at this 4.5 star serviced apartment accommodation in Adelaide. Mantra on Frome provides stylish 4 star accommodation offering the discerning traveller a variety of choice including studio, one, two and three bedroom apartments. Perfect for guests travelling overnight or extended stays on business or pleasure. Mantra on Frome is just a short stroll from the CBD, Rundle Mall and the best shopping, theatres, restaurants and entertainment in the city. The longer your stay in Adelaide, the cheaper the accommodation rate will be! La Loft provides a range of luxury apartments with private balconies, including penthouse suites with fabulous views of the city of Adelaide. Our accommodation offers a wide range of services to make your stay a memorable experience. Located in the heart of Adelaide CBD, Franklin Central Apartments provide serviced apartment accommodation whilst visiting all the dining, shopping and entertainment precincts in Adelaide. These contemporary and self contained Adelaide apartments are the ideal accommodation base from which holiday makers can explore Adelaide or business executives can enjoy an affordable home away from home. Discount apartment rates are also available for the Franklin Apartments located on North Terrace, directly opposite the Adelaide Convention Centre. The Oaks Horizons Apartments in Adelaide offers contemporary 1 and 2 bedroom apartment accommodation with separate bedrooms and open-plan living and dining areas, fully equipped kitchen and laundry, spa baths and individual balconies. Excellently positioned in Adelaide city, directly opposite the Adelaide Convention Centre and Skycity Casino on Adelaides premier Boulevard - North Terrace - stay in comfort and style at Oaks Horizons. The Playford Hotel Adelaide Hotel is located on prestigious North Terrace in the heart of Adelaide and is a boutique size hotel offering a standard of personalised service other five star hotels just can't match. At the Playford Hotel everyday is a special day and the food prepared by internationally renowned chefs is complemented with wines from Australia's finest vineyards. The Playford also offers exclusive honeymoon suites as part of Adelaide's only boutique hotel. Guests have the rare opportunity to select either a luxurious superior guest room or an individually appointed studio or loft suite, with separate living and dining areas. All rooms have private bathrooms with separate shower, personal entertainment facilities, executive desk, Broadband Internet and fax modem access. In addition all suites have balconies and kitchenettes. Quest on King William is a spacious Adelaide CBD hotel, local restaurants that deliver and the biggest spa apartments seen in Adelaide is just the beginning. Come and experience the reassuring pleasure of Quest on King William - Adelaide accommodation most central apartment hotel. Quest on King William is located within the heritage listed T&G Building in the heart of Adelaide CBD. A pleasant walk to the city business precincts, shopping and entertainment areas, and some of Adelaide's most popular attractions including Rundle Mall and the picturesque River Torrens, Adelaide Central Markets, Sky City Casino, Adelaide Convention Centre, Adelaide Festival Centre, Museum and Art Gallery of South Australia and Adelaide Oval. This remarkable and convenient location is perfect for both the business and leisure traveller. Quest on King William is a quality four star rated alternative to traditional accommodation, offering guests a spacious apartment for the price of a hotel or motel room. Guests are offered the choice of spacious Studio, One and Two Bedroom self contained apartments. All apartments are non smoking and furnished to the highest standards for your comfort and offer guests a fully equipped kitchen including stove, oven, toaster, fridge, kettle, microwave, crockery and cutlery, a separate living room from each bedroom a private bathroom, air conditioning, wireless internet access, direct dialling phone, FREE Austar TV, Broadband Wireless Access, dedicated telephone lines for fax/modem access and ironing board. Laundry facilities are available for use on alternate floors. Quest on King William understands the needs of corporate guests and strive to ensure that all needs are accommodated. Facilities include Business Administration Service, which includes photocopying and faxing services, valet laundry & dry-cleaning service, restaurant chargeback, breakfast packs, pantry shopping service, baby sitting booking service, tour desk, lift/elevator, executive/express check out, daily newspapers, safe deposit boxes at reception, luggage storage, vending machines, room service - limited hours and 24-hr security. Quest on King William is the perfect base to explore South Australia premier attractions including the Barossa Valley, McLaren Vale and Kangaroo Island. Providing Studio apartments and 2-bedroom apartments in cosmopolitan North Adelaide, enjoy the self catering facilities that the Vines Apartments provide during your next visit to Adelaide. Surrounded by fantastic cafes and restaurants along Melbourne Street just north of Adelaide CBD, this apartment accommodation is particularly ideal for long term stays with great discounted rates available! Offering a range of studio, one bedroom and two bedroom apartments, the Oxford Terraces Apartments provide apartments that are fully self contained with contemporary facilities. Located nearby are many Adelaide shopping precincts, restaurants and cafes, entertainment venues and city parklands. Enjoy the sights and attractions that Adelaide has to offer before relaxing in this apartment accommodation. Magnificent European-styled, landscaped courtyards mark the entrance to the Majestic Old Lion Apartments, which are perfectly located in cosmopolitan North Adelaide amongst a vast array of cafes, restaurants and stores. Majestic Old Lion Apartments offer 4 star1, 2 & 3 bedroom self contained apaartments accommodation situated just a few minutes drive from the Adelaide CBD and the main retail hub - Rundle Mall. Majestic Old Lion Apartments offers 57 serviced apartments, each decorated in earthy timbers with crisp white linen, which are both spacious and functional, ideal for leisure or corporate guests, groups & families. All apartments accommodation feature FREE secure on site car parking, full modern kitchen and laundry facilities, wireless internet access , FREE cable TV , private balconies/courtyards & views to inspire. The new Superior Annex Apartments, part of the Majestic Old Lion Apartments Accommodation are the newest edition to the North Adelaide accommodation scene. Set back from the road, these modern and spacious 1 bedroom self contained apartments offer an ideal location for the business or leisure traveller. Opened in February 2009, each of the 9 luxurious Superior Apartments are decorated with the finest of modern finishes including King Size Beds with crisp white linen, large LCD televisions with Foxtel and IPOD docking stations, modern kitchen and laundry facilities, Broadband internet access, electronic safes to fit standard size laptops, reverse cycle air conditioning and heating, direct dial phones & writing desks. Majestic Old Lion Apartments is a strictly non smoking property. Facilities include in-room dining menus, a tour desk, FREE secure under cover parking,FREE cable TV, air conditioning, luggage storage, dry cleaning service, laundry service, fax and photocopying facilites. 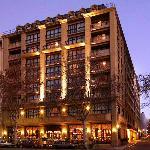 Majestic Old Lion Apartments are an ideal base to explore and enjoy Adelaide and its delightful surrounds. Majestic Old Lion Apartments - your next 'home away from home'. Stay a night or stay a while. Mansions on Pulteney (formerly the Quest Mansions) is a quality three and a half star rated alternative to traditional hotel accommodation, offering guests a spacious heritage style apartment for the price of a hotel or motel room. Conveniently located in the heart of Adelaide city, Mansions on Pulteney Serviced Apartnments are located at 21 Pulteney Street, between Rundle Mall & North Terrace. Mansions on Pulteney is walking distance to Adelaide's key attractions including the cosmopolitan Rundle Street featuring a variety of cafes, restaurants and boutique shopping. The 100 year old building creates a beautiful setting for the uniquely spacious boutique apartments accommodation. Guests are offered the choice of spacious studios & one bedroom apartments, ideal for short stays whether it be business or personal, right through to long stays for relocation and family holidays. At Mansions on Pulteney Serviced Apartments, guests enjoy comfortable living with many facilities at their fingertips. All apartments accommodation are non smoking and feature a beautiful open plan design with no compromise on space. Recently refurbished, this historic building from 1912 still boasts many original features including high ceilings, spacious rooms and most apartments feature private balconies for those preferring the fresh air. At Mansions on Pulteney utilise the guest laundry and BBQ facilities on the rooftop entertainment area, prepare your own meals and snacks in yur fully equipped kitchens. Further services include valet laundry & dry-cleaning service, secretarial babysitting service and tour desk. Mansions restaurant offers an extensive a la carte menu for both lunch & dinner Monday to Saturday. Mansions on Pulteney is located in the central business district and close to the Universities, Royal Adelaide Hospital, Botanic Gardens, Adelaide Zoo & Rundle Mall. Ideal for the corporate guest as well as the leisure traveller, Quest Mansions provides easy access to the commercial hubs of Adelaide. Spacious apartments provide guests the ability to work privately and offer the flexibility for guests to attend to business tasks, conduct small meetings and interviews. To accommodate professional needs, each apartment provides guests with wireless internet access and dedicated telephone lines for fax/modem access, with the opportunity to utilise the secretarial service to add that finishing touch to any business request. Located in a tree lined street of cosmopolitan North Adelaide and set against a backdrop of manicured gardens and old stone buildings, Majestic Tynte Street Apartments provide luxury 4 star studio self contained apartment accommodation away from the hustle and bustle. Only 4km from the Adelaide City CBD and with secure on-site parking provided, these boutique serviced apartments are ideal for the leisure and corporate traveller alike. Tastefully refurbished in 2008, the self-contained Majestic Tynte Street Apartments are fully equipped with kitchen and laundry facilities, along with access to high speed internet enabling you to stay connected and FREE cable TV ( 5 channels of Foxtel TV) to keep you entertained - ideal for both long- and short-term accommodation. All apartments are spacious (approximately 35 sqm), further featuring 1 Queen Size Bed, electric blanket, electronic safe, DVD players, reverse cycle Air conditioning and heating, balcony , opening windows and direct dial phone. Majestic Tynte Street Apartments are non smoking apartments. Property facilites include dry cleaning service, laundry service, luggage storage, on-site secure undercover parking, in-room dining menus, secure intercom/visitor access and wheelchair accessibility. For corporate clients fax and photocopying facilites are available on request. Ideally located close to the Adelaide CBD, with secure on-site parking provided, the Majestic Tynte Street Apartments provide boutique 4 star serviced apartments, perfect for corporate and leisure cients alike. They are a fantastic base for a day spent exploring historic North Adelaide. For the sport enthusiast, the Adelaide Aquatic Centre, the lush green playing fields of the parklands and a day at the cricket at famous Adelaide Oval are only a walk away. Brand new apartment accommodation right in the heart of the Adelaide CBD. That is what the Miller Apartments Adelaide offers families and corporate business travellers to Adelaide. Situated amounst the numerous restaurants, cafes, shops and nightlife of cosmopolitan Hindley Street this quality accommodation comprises of both 1 and 2 bedroom luxury apartments with facilities such as gymnasium, business centre and secure carparking to make your stay in Adelaide feel like home. Voted Best Value Hotel in Australia for 2009 by global online travel agent, Majestic Roof Garden Hotel is a new inner city boutique hotel that oozes personality and charm, offering 4.5 star luxury hotel accommodation in the heart of the Adelaide CBD. From its hallmark roof garden to the last detail of interior design, Majestic Roof Garden is a chic, contemporary boutique hotel of the highest quality. Created with the discerning traveller in mind, the interiors of this 120 room hotel are an enviable mix of cosmopolitan class and a flow-through of space and light - the softest shades of earth, the sparkle of precious metal and ambient lighting integrate perfectly with a concept of less is more. Accommodation at the Majestic Roof Garden Hotel is all about style and comfort. This means crisp white linen, opulent Japanese inspired bathrooms and tasteful modern furnishings. And let's not forget the superior in-room features you will come to expect, including large-screen TV, FREE cable TV with 6 channels of Foxtel, on-demand movies, reverse cycle air conditioning, marble & glass writing desk, access to broadband internet to keep you connected, facility, business services, secretarial services, photocopying, faxing services, a fitness centre, lobby, with lounge & 2 internet stations, a restaurant and bar, a 24 hour front desk, bar/lounge, concierge, guest laundry, dry cleaning service, laundry service, lift/elevator, luggage storage, non-smoking floors, off-site secure undercover parking, 24 hours room service, tour desk, valet parking and wheelchair accessibility. Location is key, and no hotel is better situated than the Majestic Roof Garden Hotel. A few steps from the foyer will put you in the heart of the vibrant East End with the Adelaide CBD and Rundle Mall just a short stroll away. Majestic Roof Garden Hotel - a place in which to be and be seen with the kind of personalised hospitality you will come back for. Friendly, unobtrusive and utterly professional, capturing absolutely the essence of what it means to be a welcome guest. The RNR Serviced Apartments Adelaide offers 4 star luxury 2 & 3 bedroom self contained townhouse apartments. Located in the Adelaide Southern CBD, in the heart of Adelaide's City Square, the RNR Serviced Apartments is just minutes walk to Victoria Square, Rundles Mall, Gouger Street and the Adelaide Central Markets. Enjoy the close proximity to Adelaide's renowned restaurants in Gouger, Hutt & Rundle Streets, the Central Market and Chinatown. Savour the city's history and architecture along tree-lined streets. Peaceful yet exciting. The inner city address and quiet side street location makes the RNR Serviced Apartments the perfect option for either the business or leisure traveller. Offering modern 2 & 3 bedroom 2 bathroom townhouse apartments, RNR Apartments give you the freedom to make your own choices while away from home. Each townhouse apartment is stylishly furnished and spaciously designed with fully equipped kitchen and laundry facilities, a private lock up garage for one vehicle and ducted reverse cycle air-conditioning which ensures your stay as comfortable as can be throughout any time of the year. All apartments are 100% non smoking but have their own private balcony and courtyard for smokers. Apartments also have their own private balcony, spacious living/dining area and separate study with Azure internet access. The three bedroom apartments are ideally located in Adelaide's East end close to Victoria Park Race Course, The Wakefield Hospital and the Clipsal 500 racing circuit. Accommodating up to 6 people in comfort, these three story serviced apartments are ideal for large families, sporting groups or business colleagues travelling together. Ideal for the business traveler, families and sporting groups, our 4 star apartments offer superb serviced apartment accommodation for the price of a hotel room. Further facilities include FREE car parking, valet laundry & dry-cleaning service, restaurant chargeback (have your meal charged back to your accommodation account at a range of popular local restaurants), breakfast packs (all the ingredients for you to prepare breakfast in your own apartment), pantry Shopping Service (a comprehensive and convenient alternative to personal grocery shopping), secretarial service, baby sitting service, tour desk, safe deposit boxes, car rental facilities available and photocopy service. RNR Serviced Apartments Adelaide is the perfect base to explore South Australia's best destinations, including Kangaroo Island , the Barossa Valley , the Mclaren Vale, Glenelg, Victor Harbour , the Clare Valley as well as the quaint German village of Hahndorf and the Adelaide Hills. Quest on Sturt is walking distance to all of the city's attractions: Rundle Mall, the Adelaide Central Markets, Victoria Square, the Sky City Casino, the Museum, the Art Gallery , the Botanic Gardens, Adelaide Oval cricket ground, Memorial Drive Tennis Centre, the Royal Adelaide Showground and a wide range of restaurants, cafes and bars. Great breakfast deal on offer! Stay between 15th May - 15th June in a 2-bedroom apartment at The Grand Apartments & receive either a hearty breakfast pack for 1 guest or 2 continental breakfast packs for 2 guests. Located in North Adelaide, this 4-star serviced apartment accommodation is ideally situated whilst visiting Adelaide, North Adelaide and seaside Glenelg. Providing modern and spacious apartments, this accommodation is city living with a village atmosphere. Located close to the Zoo, Botanical Gardens, Adelaide Oval, the Casino, Festival Centre & Adelaide Entertainment Centre. Sombrero Motor Inn is located only 6 kilometres north of Adelaide city centre. Comfortable and spacious 4-star accommodation able to cater for up to 4 guests in apartment style and hotel suite accommodation. Dine in the restaurant, sample the room service or head into Adelaide CBD. Easy access to North Adelaide too. Secured car parking available on site. Stay longer and pay less! Providing charming and quality 2-bedroom apartment accommodation in Adelaide, City South Apartments are situated in a quiet environment within the Adelaide city centre. Stroll to Adelaide CBD, the Central Markets and public transport. This secured, self contained serviced apartment accommodation is ideal for longer term visits and relocations to Adelaide. Located in the heart of Adelaide, the Windsor Apartments provide spacious executive two and three bedroom serviced apartments that are fully self contained with complimentary car parking available on site. Walk to all city attractions, shopping, the CBD, restaurants & cafes, and North Terrace is also an easy distance away. Great weekly, monthly and long term rates available. The longer you stay, the cheaper the rate! Providing beautifully appointed, boutique style apartment accommodation, the Chelsea Apartments afford stunning views over the Adelaide city centre, Adelaide Hills and/or surrounding parklands. These 2-bedroom apartments are self contained and open out to luxurious terrace balconies to ensure your stay in Adelaide is comfortable and relaxed. The central Adelaide location makes access to all city attractions very easy and there is complimentary car parking available at the property. At the Adelaide DressCircle Apartments the exclusive range of fully furnished studio, one and two bedroom apartment accommodation is superbly located in the Adelaide City and North Adelaide areas. Privately owned and operated, these uniquely individual, executive style apartments will provide you with a home away from home environment. Whether it is for business, holidays, in-between houses, short or long term stays the Adelaide Dresscircle Apartments is the perfect place to stay.